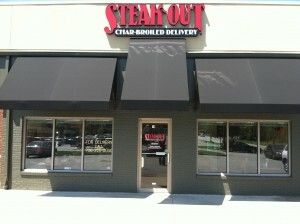 Steak-Out is proud to serve up sizzling steaks, juicy burgers, and crisp salads for the Columbus, GA community. Find us on Woodruff Rd., just across the street from St. Francis hospital. Whether you are looking for a place to sit down for a quick bite, or a comfortable table to treat your family, our dining area is a great place to enjoy a meal. But if you prefer enjoying a restaurant quality meal in the comfort of your own home, we can help with that too. Simply give us a call or place an order online.